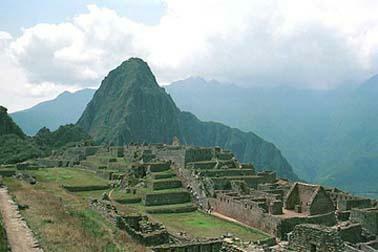 To some, Machu Picchu is the most exotic city in the world. To others, its just another archaeological site from an ancient culture to be seen in as short a time as possible and then to move on to another. But Machu Picchu is more than that. It has an almost magical quality about it that separates it from the rest of the world's tourist sites and puts it in a class by itself. To reach the extensive ruins atop a 7000-foot peak in the middle of the jungle, I first had to fly to Cuzco, the former capital of the mighty Inca empire. From here, I took the daily train, departing at 7 A.M. for the four-hour trip to the foot of the mountain on which Machu Picchu stands. The 75-mile diesel rail car trip from Cuzco to Puente de Ruinas is wildly scenic and an adventure I cant forget. After ascending the mountains surrounding Cuzco by a series of switchbacks, the train plunges down a wide, cultivated valley beyond which are glacier-clad peaks. Further along, I saw Inca ruins and terraces still being used today by their descendants. At one point I noticed an old Inca bridge, still in use, spanning the wild Urubamba River. As the train sped along the riverbank, I caught glimpses of brightly plumed parrots flying through the tall trees and of exotic jungle plants that look like my own house plants but are 20 times the size. Nearer to the site, the tracks follow the base of the steep-walled Urubama Canyon with almost perpendicular walls of rock thrusting upwards to the sky. The approach was grand and awe-inspiring as I neared Puente de Ruinas. Luckily, I sat on the left side of the train so I could get some spectacular photographs. I could hear the deafening roar of the river rapids as I departed the train and boarded the minibuses that took me and several other people to the old city. I could still hear the rapids as the bus climb over 1300 feet by a series of switchbacks during which I was leaning over the road down into the canyon at the train I just left. Finally, the rapids because a faint roar as I climbed out of the bus into the cool thin air of the mountaintop. At first, there didnt seem to be anything worth seeing, but after a few minutes on a dirt trail, I come to the vista that must have been first seen in 1911 by Hiram Bingham, who stumbled upon the ruins that had laid silent for centuries. It stopped me in my tracks. Heavenly, magical, intense, breathtaking--these are only some of the words that describe this place. Sheer rugged mountains covered with soft velvety carpets of green seem to nestle the gray stone ruins as if in the palm of the hand of God. Terraces spill down to the central plaza under fluffy white clouds and an azure blue sky, all seemingly suspended near heaven and overlooked by Huayna Picchu, the new peak. The atmosphere here changes as often as the light, sometimes every few minutes, and even a brief tropical rain didnt hamper the enchantment of the city. Artists relish the varied hues that seem to emerge from the granite stones throughout the day, but for some its the sound of Machu Picchu that remains fixed--the roar of the Urubama far below, the unending boom of thunder not very far above. Thunder is the city's natural watchman. It growls and grumbles even when the sun is most intense, and on overcast mornings, when ghost-gray clouds roll across the mountain peaks and slide between their creases, it's as if some Mephistophelian creature were preparing an entrance. As I descended into the city, I saw the rounded House of the Sun and the mile-long, open aqueduct that brought water from springs higher up on the mountain. No doubt the Incas succeeded here in combining the wonders of nature with those of man. Traces of a well-planned city are still evident--the watch tower, remains of temples and houses, baths, over 100 stairways, all different, and 200 buildings of white granite. This fantastic feat of engineering covers over two square miles and since the Incas had no iron tools, stone hammer construction must have taken centuries. Its a tribute to Machu Picchu's inaccessibility that the city's ruins were not discovered until 1911. It's origin is still a mystery, but locally it is believed that the city was built by an Inca ruler named Pachacutec early in the 15th century. According to Bingham, it was probably erected on the foundations of a much older city, Tampu-Tocco, where Manco Capac, the first Inca, was born. The Incas constructed their mile-high city of granite blocks with no mortar. They erected their buildings with incredible precision cutting stones so perfectly that they supported each other without help. Part of the mystique of Machu Picchu comes from its visual and aural splendor, but some also comes from its interesting history. Most of the residents were women, known as the Chosen Women or the Virgins of the Sun, the Incas most powerful god. Selected for their beauty and the prestige of their families, they were educated in Cuzco and sent to Machu Picchu for the rest of their lives. For Machu Picchu was really a religious cloister from which no one wandered. The best time to see the city is at sunrise and the only way to do that is to stay at the hotel on the mountain. Though the rooms are small, the food bland, and the lights automatically turn off at 10 p.m., its still a unique experience. However, most visitors make a on-day visit to Machu Picchu, beginning in the early morning hours from Cuzco and returning around 9 p.m. I felt the effects of the altitude, since I was at higher elevations almost the whole time. Though Machu Picchu stands at only 7,000 feet, Cuzco is at nearly 12,000 feet and the altitude definitely affected me. In fact, I passed out while eating lunch�what must have been a regular occurrence since every public room in my hotel had a container of oxygen standing in the corner.